Add height and function to your outdoor patio or porch with the Nautical Trestle 38" x 73" Bar Table. This all-weather table seats up to six guests for drinks, appetizers, or game night on a table top with slightly rounded corners and plenty of leg room underneath. Add height and function to your outdoor patio or porch with the Nautical Trestle 38" x 73" Bar Table. This all-weather table seats up to six guests for drinks, appetizers, or game night on a table top with slightly rounded corners and plenty of leg room underneath. 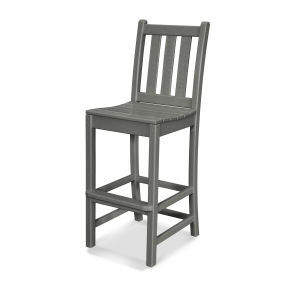 To complete the look, choose from a variety of POLYWOOD bar chairs; this durable bar table pairs well with many different chair designs.